The Tanoshiboy Chronicles: Design & Illustration Blog: "...a bat, man...it was a giant bat!!!" "...a bat, man...it was a giant bat!!!" What can I say? I'm a huge Batman fan and it's been awhile since I've had the chance to do a sketch of the Dark Knight Detective. 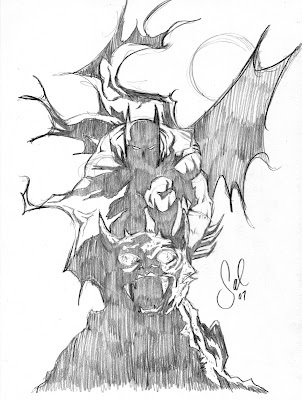 For this piece I wanted to go back to the dark Batman (but I wanted the cape to look as if it was alive, chaos driven)- Neal Adams meets Jim Lee with a touch of Mike Mignola. Pop culture representations have Batman looking slick or armored-up. I wanted the dark, scary Batman; so if you looked out the window on a cold dark night, you'd piss yourself scared when you saw this bad boy staring into your eyes.